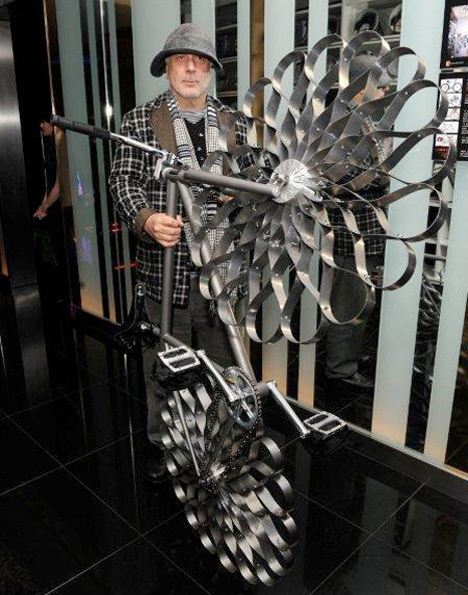 This definitely isn’t your ordinary bike – but is it art or is it a functional piece of transportation? Both…kind of. The Two Nuns Bicycle was created by designer Ron Arad to be auctioned off in a fundraiser for the Elton John AIDS Foundation. Each wheel was lovingly constructed out of 18 connected strips of steel. As you can see in the video, it is possible to ride the strange contraption around. Possible, but not easy. The bumpy wheels look like they make the ride feel uphill at all times. Maybe if you’re looking to build up your leg muscles this bike would be the perfect solution. The bike wasn’t actually meant to be ridden regularly. Although it is clearly fit to ride once in a while, it’s more a work of art than a mode of transportation. The delicate-looking patterns of the steel wheels would look perfectly at home hanging on your wall among other pieces of fine art – but would you be able to resist the temptation to take it down and ride it around? See more in Art Vehicles or under Transportation. November, 2011.